I've been baking bread at home for over ten years, trying several different methods during that time. The first book that helped me get more serious about bread was Dough by Richard Bertinet. After that was Mark Bittman's New York Times article about Jim Lahey's revolutionary no-knead method and book My Bread. Finally, Ken Forkish's Flour Water Salt Yeast is the source of my current recipe and technique. His Portland restaurants' bread and pizza simply speak for themselves and I rushed out to get his book after tasting his bread. I really appreciate Forkish being very detailed in using scales (in grams), thermometers, and percentages so that we can get a handle on the relationship of the ingredients. This allows for very easy up and down scaling of batch size, plus makes it easier to experiment and adjust to our own tastes. The basic recipe makes two loaves, and here I've baked one and stored the other dough in the fridge to bake later or for pizza or focaccia. Once you get the hang of the white bread, it's easy to substitute whole wheat, rye, or other flour, as well as throw in dried fruits, nuts, and seeds to your liking. The important points are hydration level, long fermentation with less yeast, and high heat baking in the cast iron dutch oven. Forkish has some good videos explaining and demonstrating these steps. 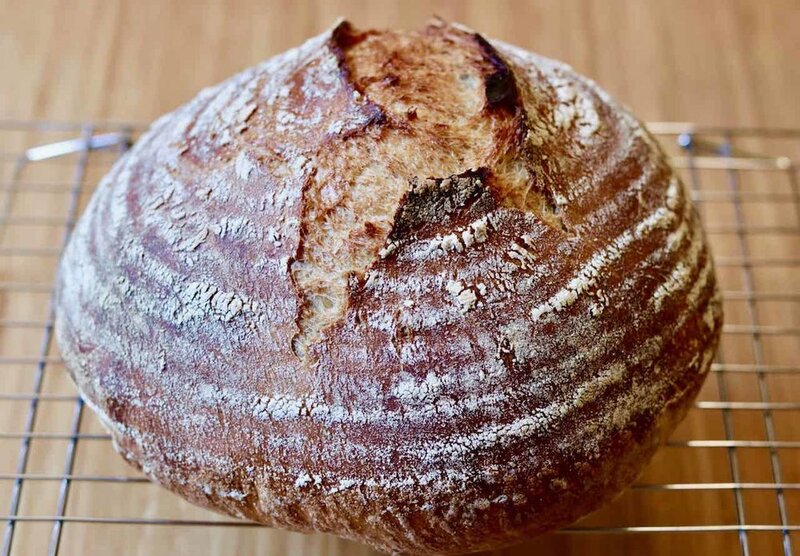 Making this bread is easy and inexpensive and the joy you can bring to others by sharing a loaf is even better than the happiness of seeing your beautiful bread come out of your own oven. 3. assistant: "ok, now you have time to play! where's da bird!"